Founded in 1986, Personal Ponies has grown into a national organization involving hundreds of volunteers throughout the country. Our Mission is to make magic in children's lives, to bring smiles and joy in a most unusual way. There is something special that happens between a pint-sized pony and a child. There is " magic " of this little animal that speaks to a child in its own way! 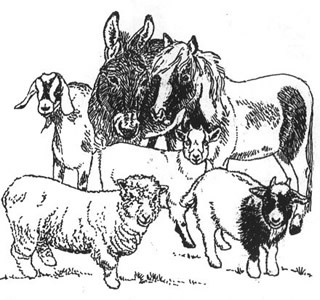 In 1994, a call from Marianne Alexander inquiring about miniature sheep brought NH into the world of PPL. It also brought pony pals into the PPL world, as ponies are never placed alone; they are always placed with another pony or a companion. Please spend some time with us. Find out about our NH Volunteers. Read about the children in NH and their magical pony friends. Contact us and ask what you can do to help spread "magic and smiles" in your community. The "MAGIC" will electrify you!! or email gail at minis2@myfairpoint.net for more information.